You can join ‘Brother 6K 6Word’ online prom oand win your own DCP-T500W. Brother's latest multi-function printer that uses it's own refined Refill Tank System . This multi-function printer from Brother, can print up to 6,000 pages in just one(1) ink bottle. A perfect solution for your printing needs while saving money to spend to your other investement(s). MANILA, July 29, 2015 - If you are social media-savvy and love to share your stories or witty one-liners, you now have more reasons to do so with Brother International Philippines Corporation (Brother Philippines)’s “short” story writing contest. 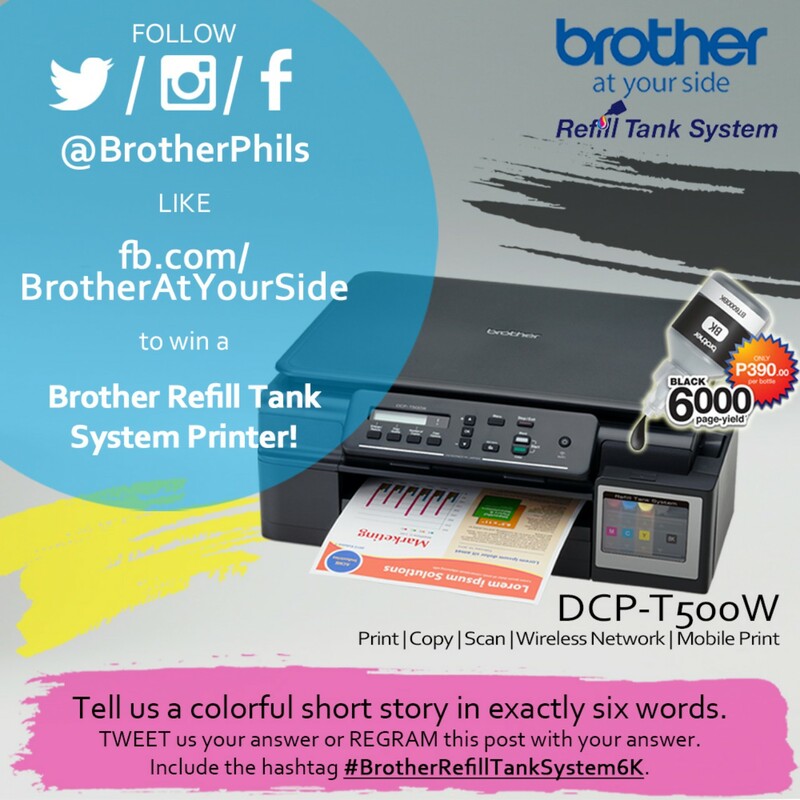 “Brother 6K 6 Word” online promo invites you and the rest of the netizenry to share your colorful short stories on Twitter and Instagram to have a chance to win the new revolutionary Brother Refill Tank System multi-function printer (DCP-T500W).The new printer has an ultra-high yield of 6,000 (6K) pages—meaning it could print up 6,000 pages in one bottle of black ink. Suggested retail price (SRP) of the DCP-T500W Php 9,450. Three units of P-Touch Label Makers (SRP Php 2,550) will also be given away as consolation prizes. To join, simply regram the promo poster that can be found at Brother Philippines’ Instagram and Twitter accounts, @BrotherPhils, with your very own original colorful six-word story. Tag @BrotherPhils on your post and don’t forget the qualifying hash tag #BrotherRefillTankSystem6K. You have the rest of July until 15 August to come up with your best short narratives. The promo poster can also be found at Brother Facebook Page fb.com/BrotherAtYourSide. Brother Refill Tank System’s smart design takes the hassle out of ink refilling while minimizing ink wastage. The new range’s built-in refill tank’s see-through cover at the front also makes it easy to check how much ink is left, while freeing up precious desktop space. Ink calibration time with the Brother Refill Tank System is also the fastest in the industry at seven minutes. What’s more, Brother Refill Tank System’s fast print speeds of up to 11 monochrome and 6 color images per minute (based on ISO/IEC 24734), is almost double that of competition’s, and is suited for high print volume users who value efficiency. The DCP-T500W model also comes with wireless networking capability. As a way to say thanks to the successful launch of the Refill Tank System, Brother is doing a special promotion for the product. From August 1 to September 30, 2015, customers will also enjoy a P500 discount for all Refill Tank System models! Just visit any Brother Authorized Dealer to avail the special promotion.